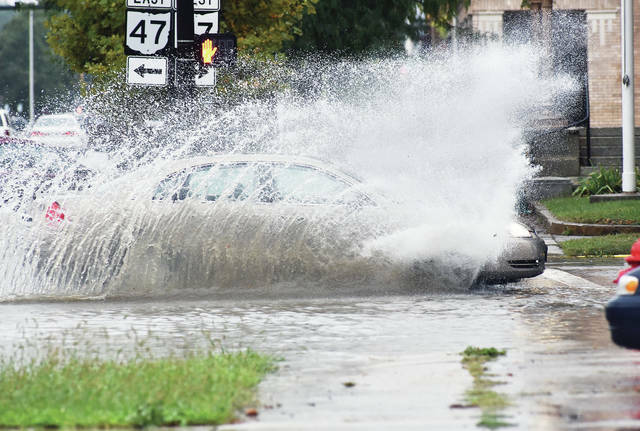 A car plows through a deep puddle that formed next to the Sidney Post Office after heavy rain fell on the county Thursday, Sept. 6. Numerous storms have caused water problems throughout the area after 4 a.m. Thursday. The Sidney Wastewater Treatment Plant officials noted 1.16 inches of rain fell on Sidney by 7 a.m. Thursday. Rainfall amounts after 7 a.m. were not available at press time.